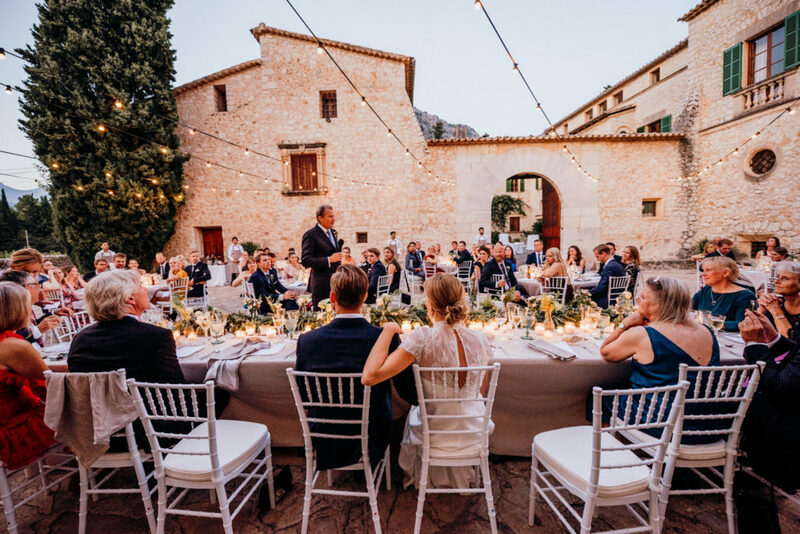 Year after year Finca Son Berga becomes part of the lives of many couples. 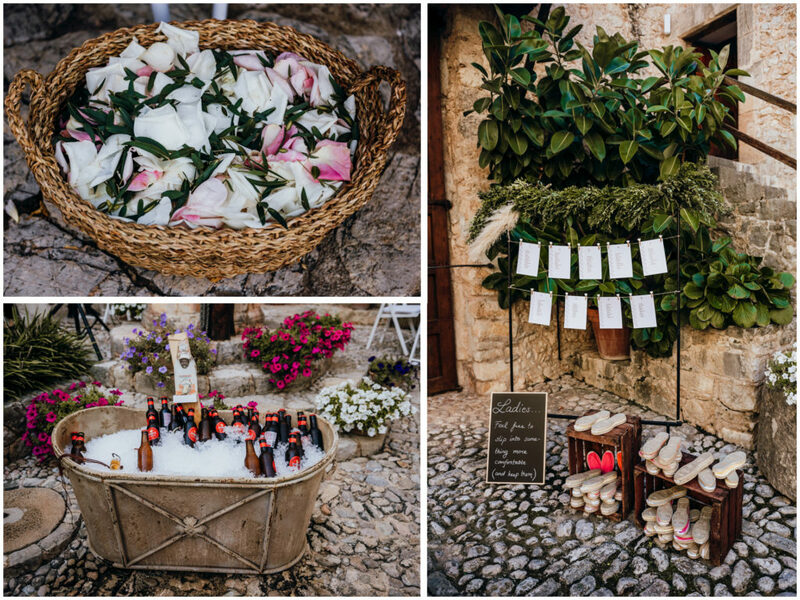 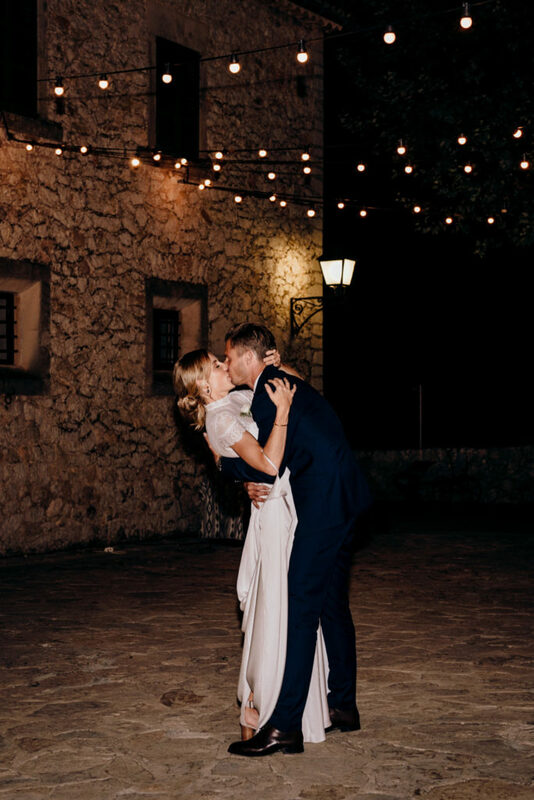 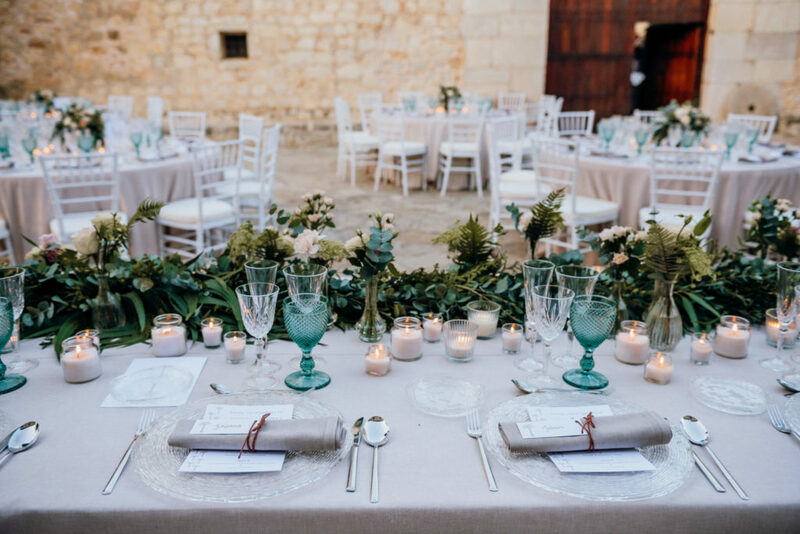 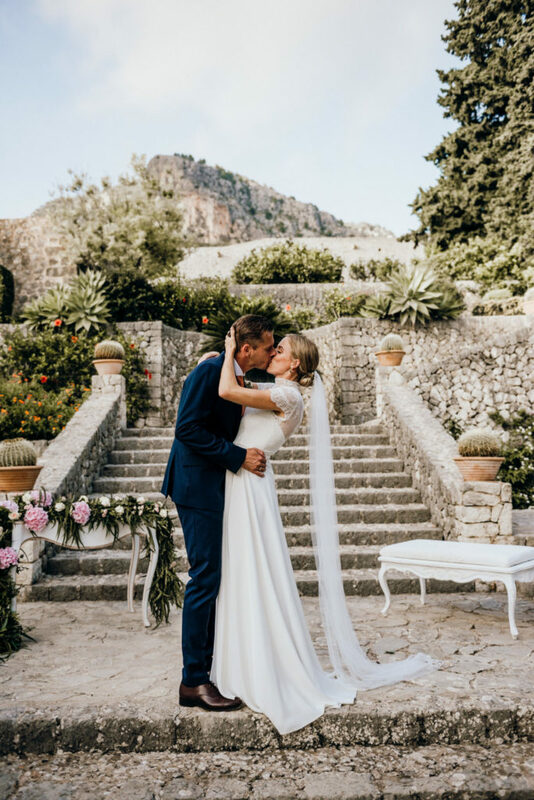 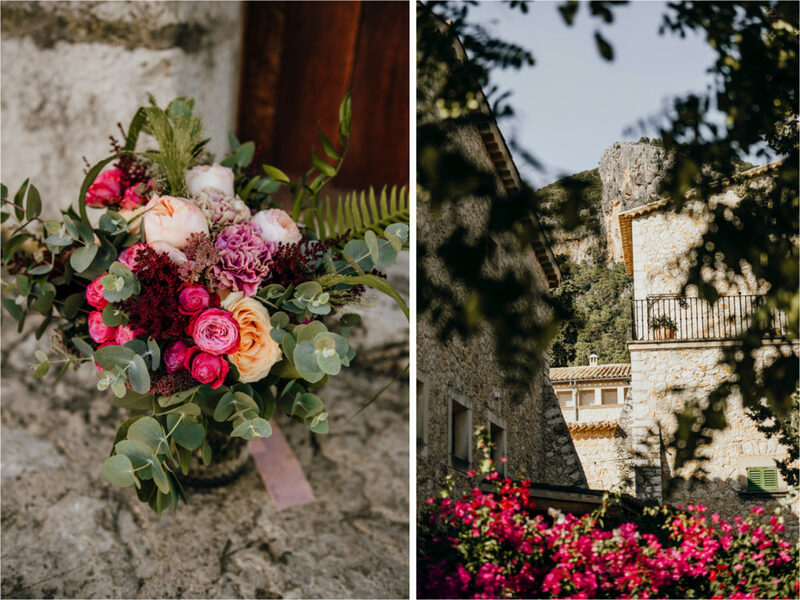 It was also a dream for Johanna and Thomas to get married in this rustic Mallorca estate. 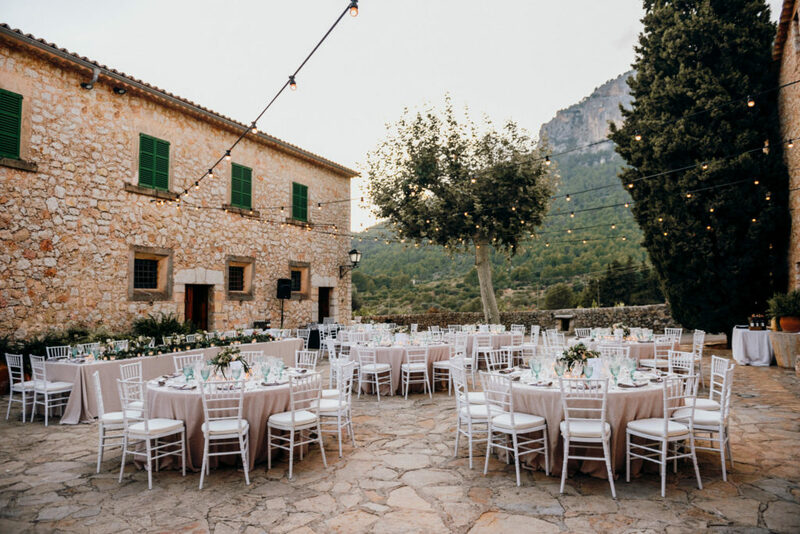 With its natural beauty and secluded rustic charm, it’s no wonder that Son Berga wedding venue has become very popular amongst many couples. 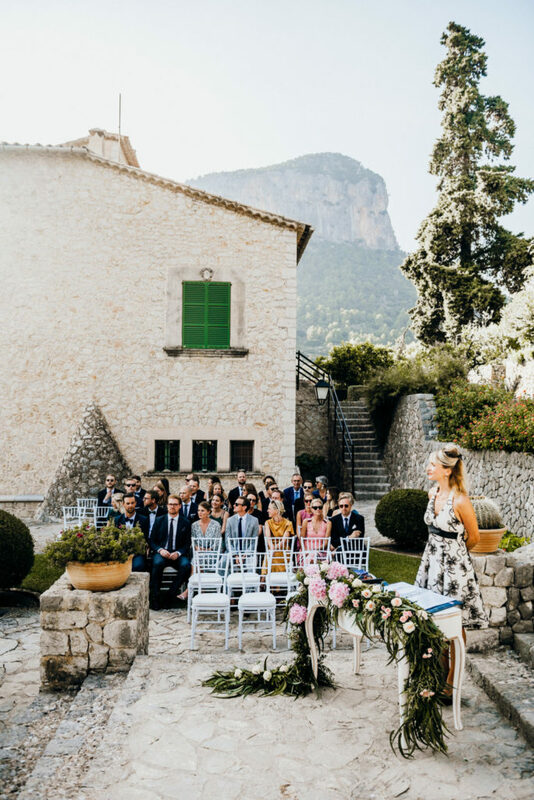 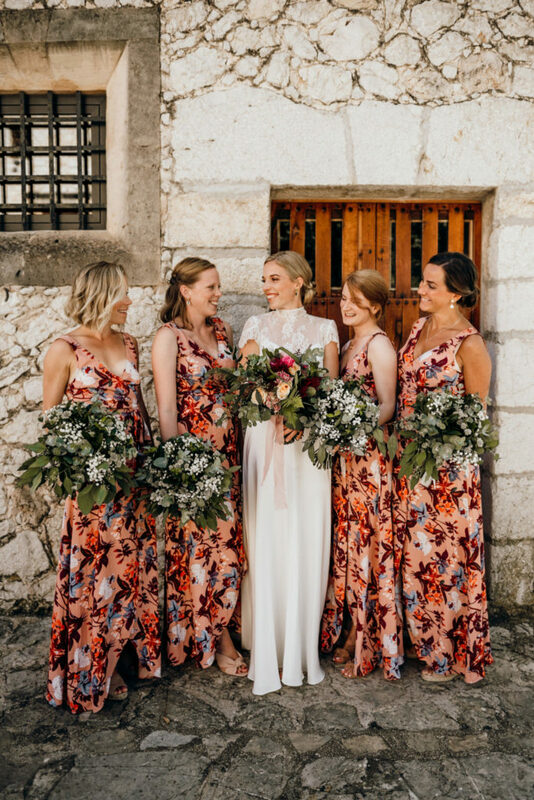 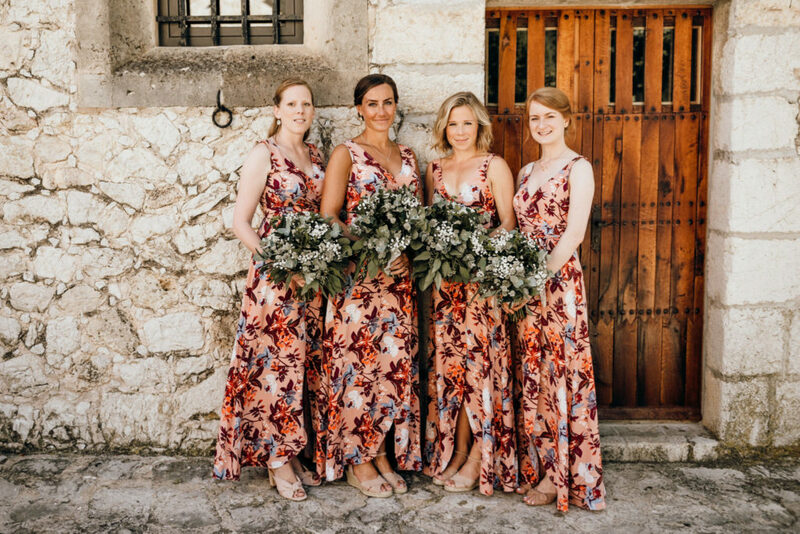 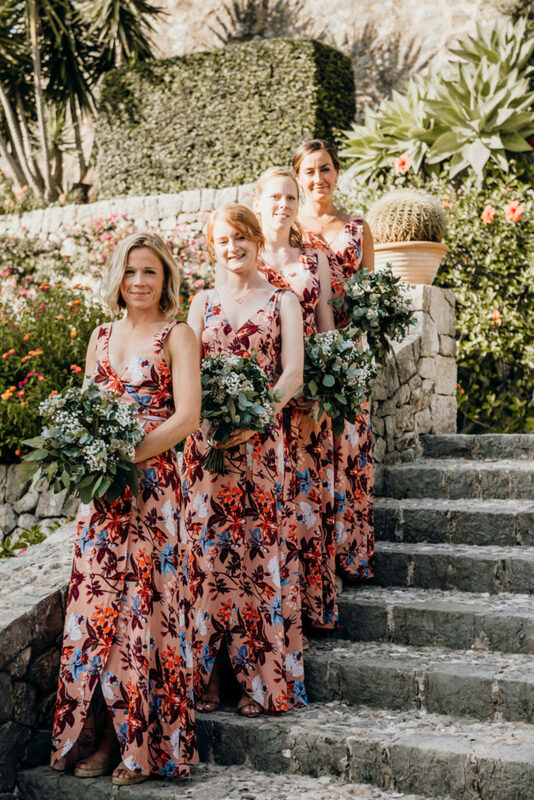 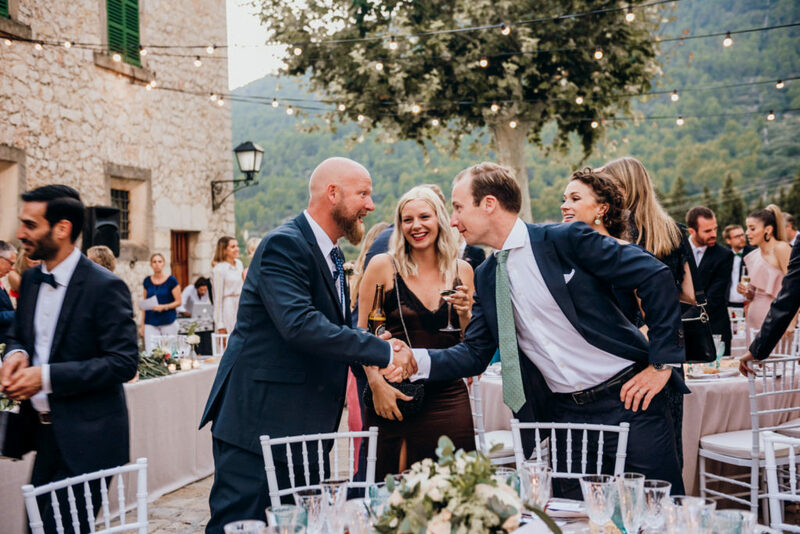 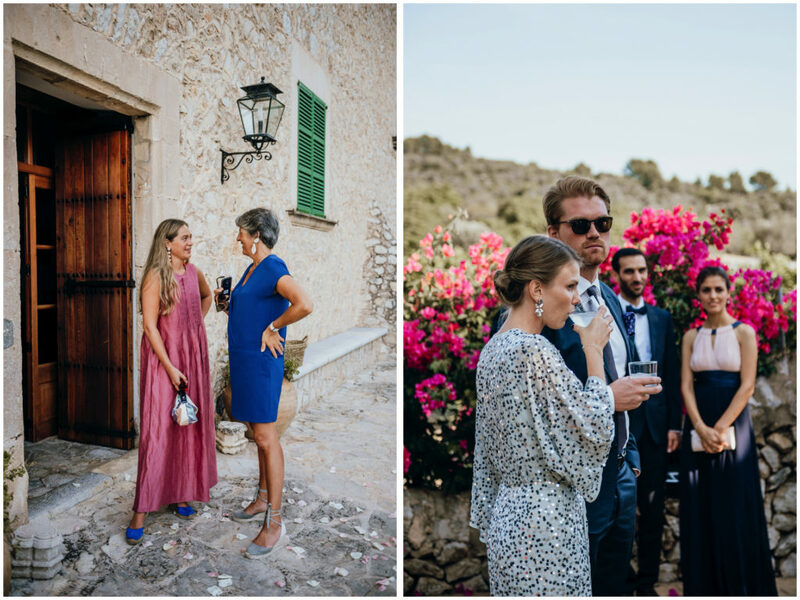 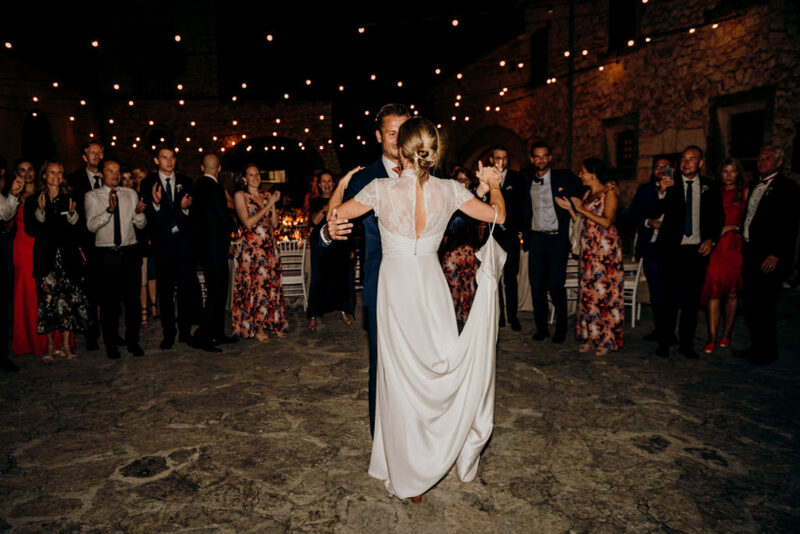 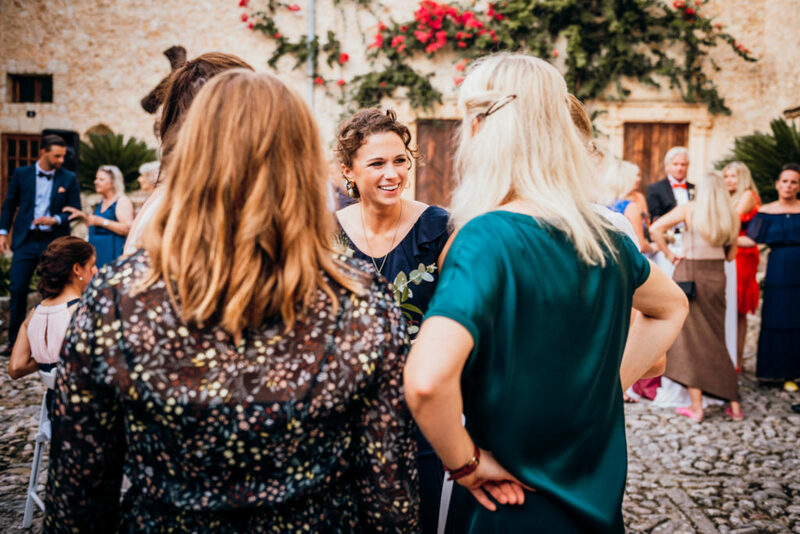 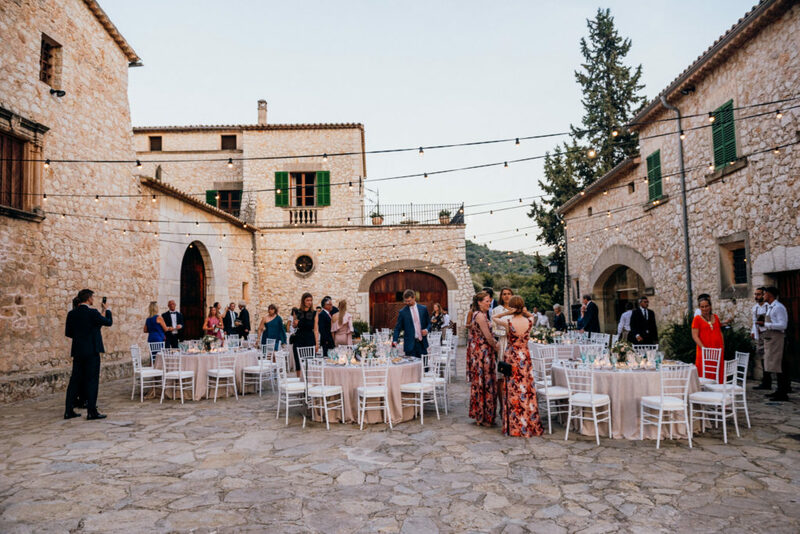 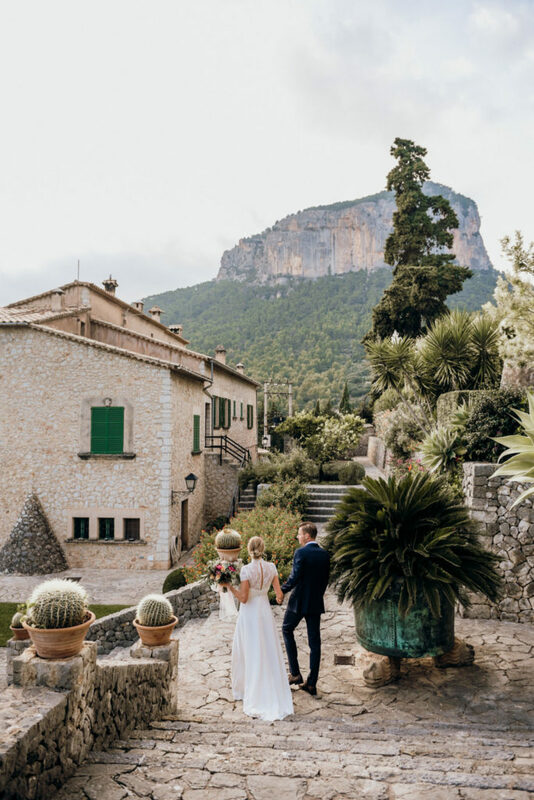 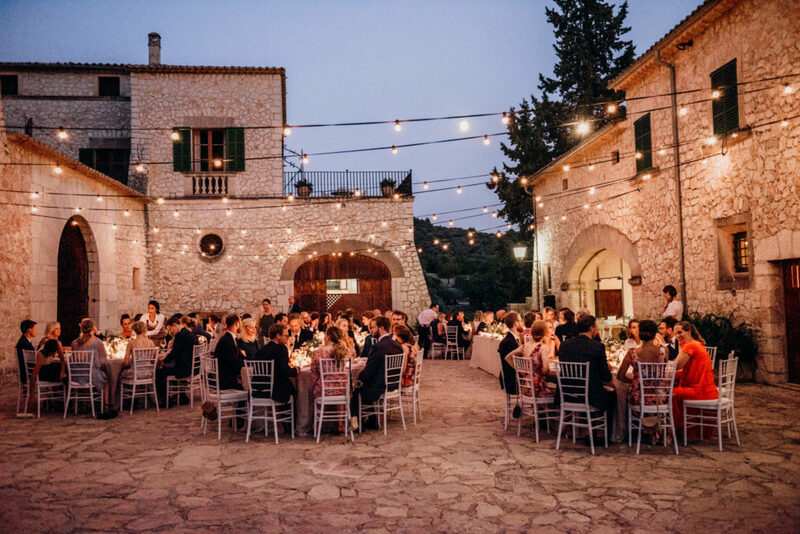 Surrounded by vineyards, olive trees and the hills of Tramuntana mountains, Son Berga wedding Finca draws its guests to celebrate in this spectacular hideaway and I was lucky enough to be part of it. 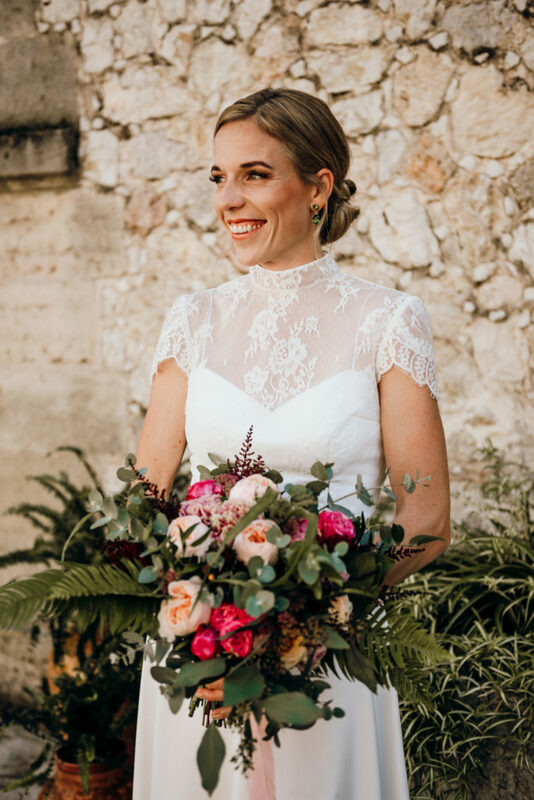 Johanna looked absolutely stunning in her self designed wedding dress, which was absolutely elegant and romantic with a touch of vintage flair. 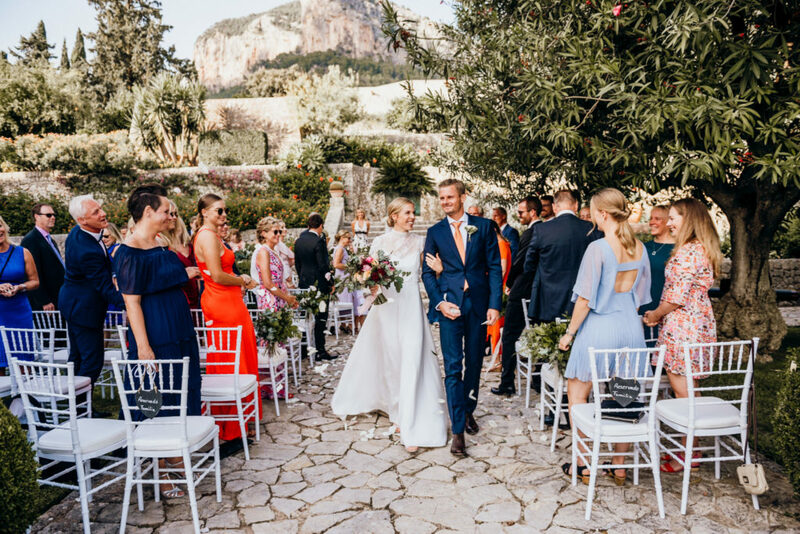 Thomas was standing at the altar with their 1,5 years old daughter Filippa as Johanna walked down the stairs together with her dad. 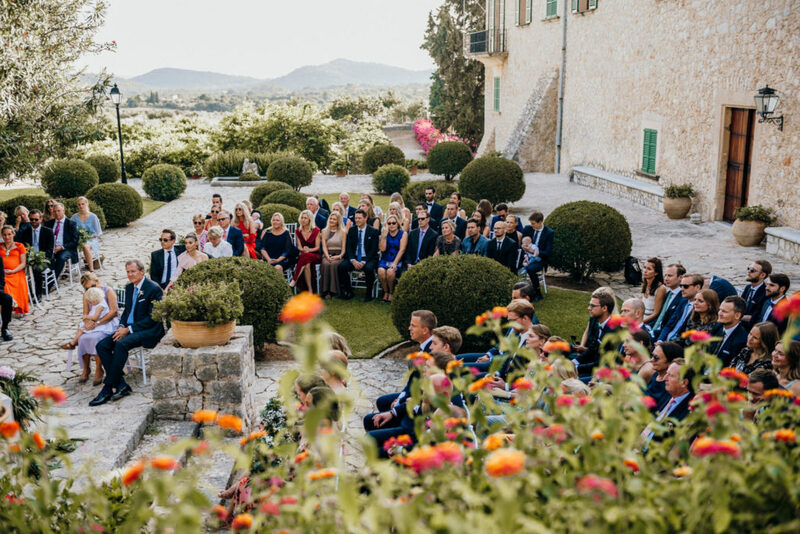 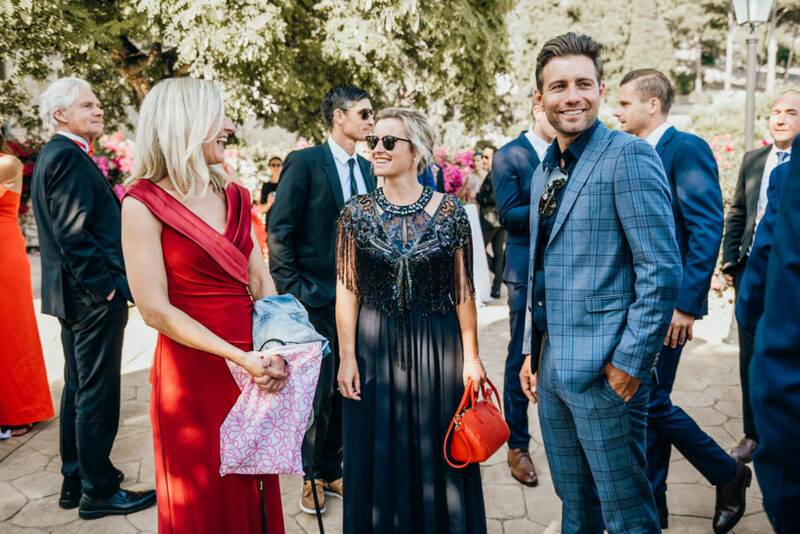 The wedding celebrant Claudia Nagyivan beautifully put together a very personal and intimate ceremony that addressed all the guests from different countries. 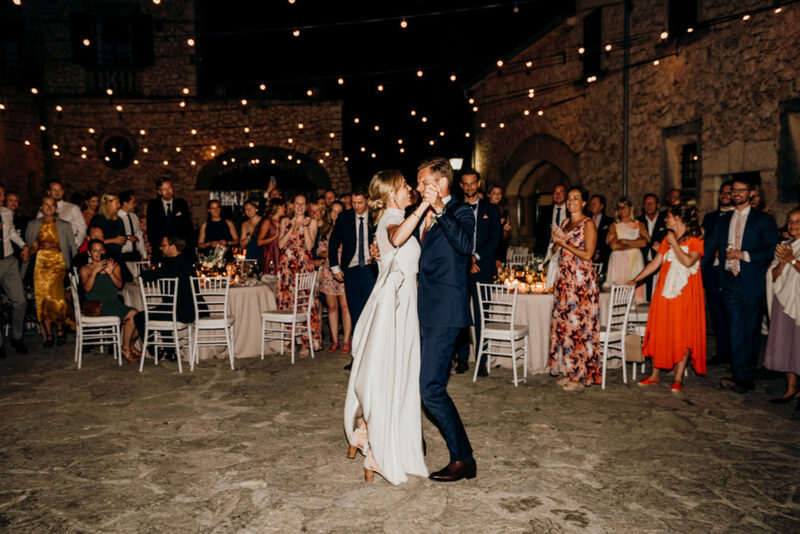 The ceremony was full with loving details about the couple that left everyone emotional and a little teary. 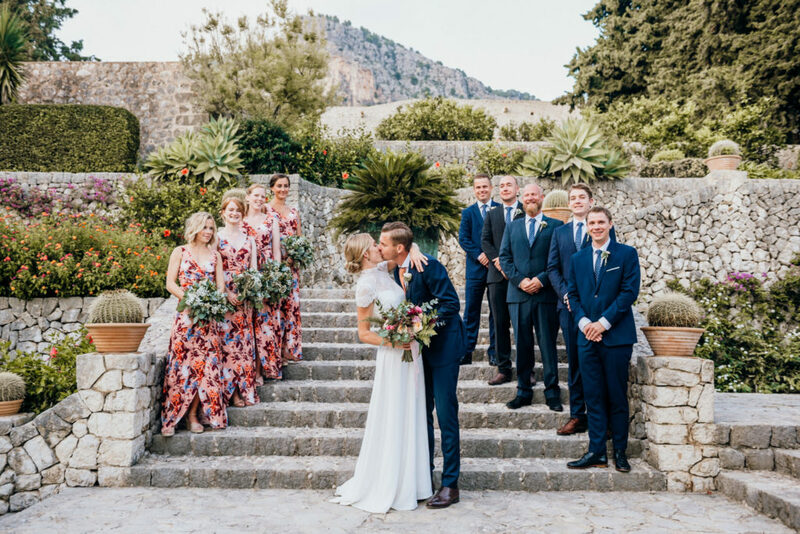 Guests from Sweden, Denmark and England came to Mallorca to celebrate and witness their I Do’s at this spectacular Tramuntana background. 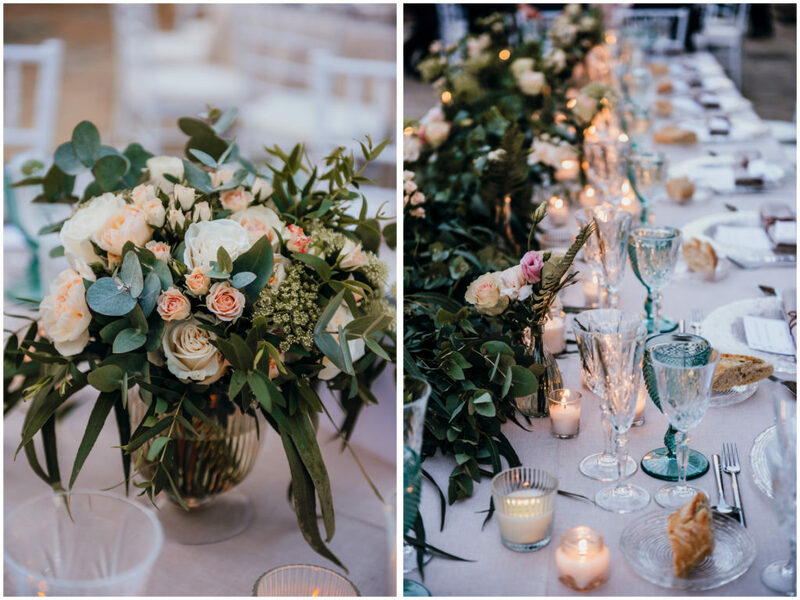 As usual, the event planners Kirsten and Eli from Son Berga created some gorgeous table settings with flower bouquets and many candles along with hanging fairy lights over the courtyard that created that dreamy romantic dining flair. 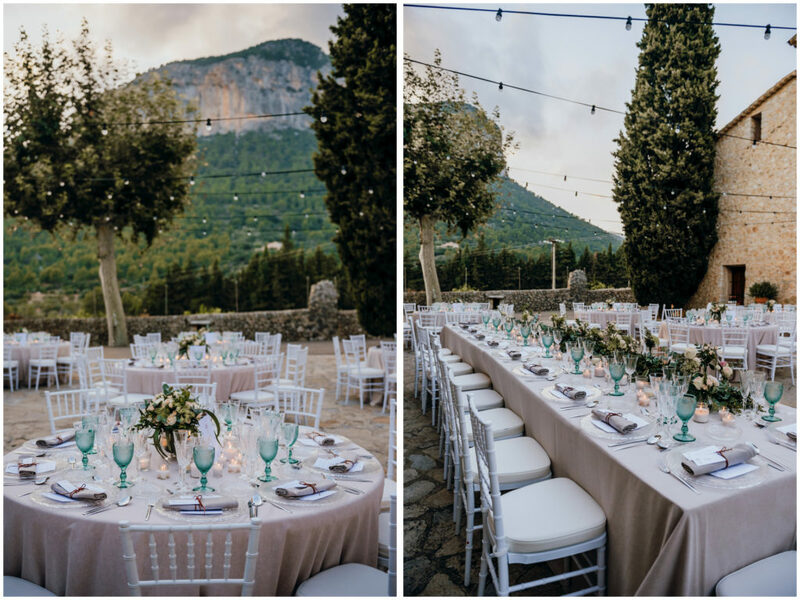 The perfect and delicious three course menu was created by Catering Jardin Events. 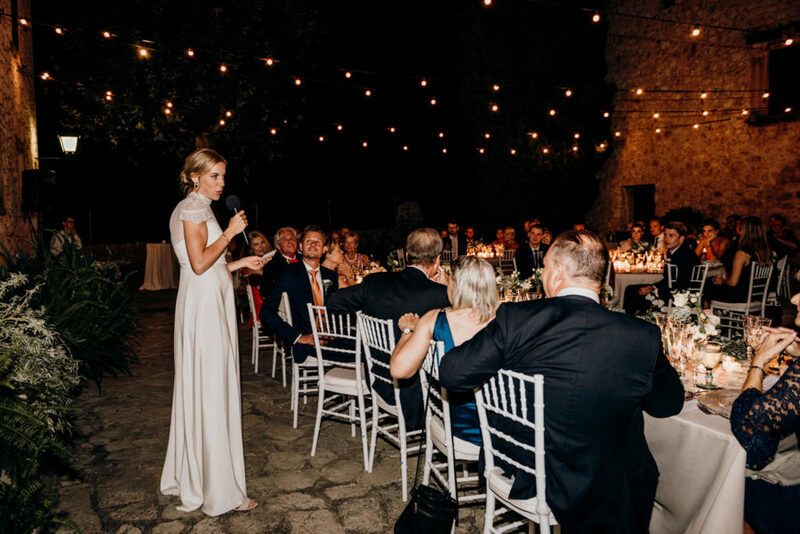 It was a truly magical evening! 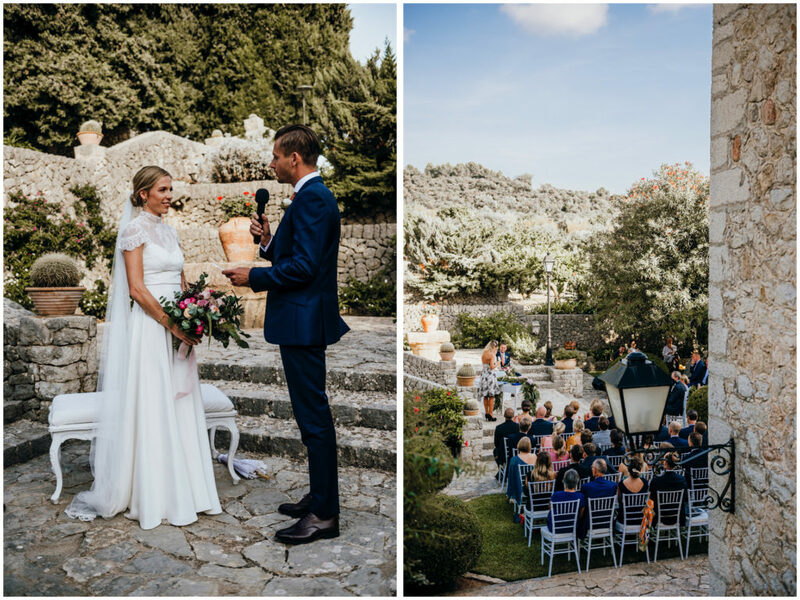 I photographed this beautiful wedding of Johanna and Thomas representing Aimee K Team Photography. 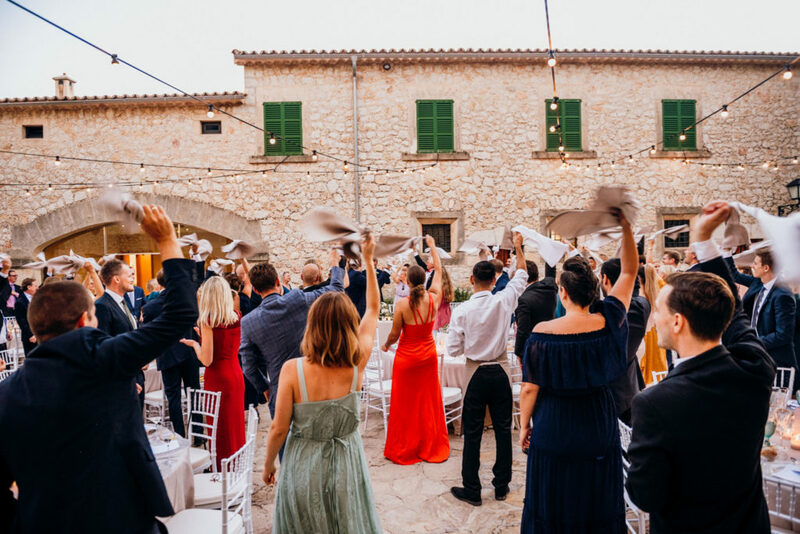 It was such an honour to be part of all the joy and laughter at one of Mallorcas most special venues and I cannot wait for all the future weddings at the stunning Finca Son Berga!